From the best-selling author of the The Ultimate Gift, now a major motion picture, comes an ageless tale with a profound message: Sometimes wisdom is where you least expect it. 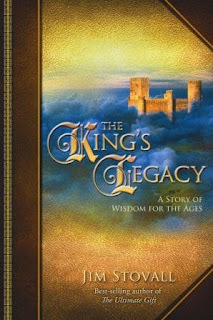 This summer, Jim Stovall’s classic parable, The King’s Legacy: A Story of the Wisdom of the Ages (David C Cook, June 2009), will return in an updated, revised gift edition. Featuring an enhanced look and new illustrations, this simple, insightful story is perfect for readers of all ages. Once upon a time, in a land far, far away, there was an enchanted kingdom ruled by a benevolent and much-loved king who, through his uncommon wisdom and insight, led his people through many difficult times to a period of peace, prosperity, and happiness such as the kingdom had never known. Now, nearing the end of his reign, the king longs to leave a lasting legacy for his people. What would be a fitting memorial to his time on the throne? A monument to rival the pyramids of Egypt? A gold coin bearing his likeness? A colossal statue carved in his image? No, such an enlightened ruler would choose a very different kind of memorial. But then the king has a remarkable idea: To discover the most profound words of wisdom in the world. So the king invites citizens from all walks of life and all corners of the realm to share with him the best of their life lessons. Farmers and physicians, hunters and historians, jesters and judges—all come before the monarch. From the wisdom that they share, the king will select the one bit that surpasses all the others, wisdom that will be passed around the world, wisdom that will benefit all people from all lands, forever: the Wisdom of the Ages. But as the king hears from more and more of his subjects, he becomes worried and restless. From so much profound and wonderful wisdom, how will he discern the Wisdom of the Ages? How will he know when he has found it? The answer comes in a form that no one, from the king to the lowliest peasant, could expect. For the greatest wisdom comes from the most unexpected of places…. Jim Stovall is a national Olympic champion weightlifter, former president of the Emmy Award-winning Narrative Television Network, and a highly sought after author and platform speaker. For his work in making television accessible to our nation’s 13 million blind and visually impaired people, The President’s Committee on Equal Opportunity selected Jim Stovall as the Entrepreneur of the Year. Jim was also honored as the International Humanitarian of the Year, joining previous recipients Mother Teresa and Nancy Reagan. He is the author of the best-selling book The Ultimate Gift, now a major motion picture.